Membership of the APPL is made up of pinball enthusiasts of all skill levels, from novice players through the highly skilled. Owning a pinball machine is not a prerequisite for joining the APPL – however, enjoying the game and having fun is. 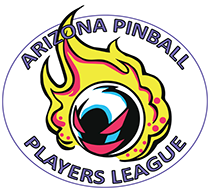 Founded in 2009, the APPL’s focus is not purely tournament driven, but also to facilitate social gatherings and helping identify other players in the Phoenix, Arizona area and bring them together in the hopes of elevating awareness and the visibility of pinball. During the pinball season (February through November) tournaments are held once a month at different locations. The APPL is sanctioned by the International Flipper Pinball Association (IFPA) and players are awarded World Pinball Player Rankings (WPPR) points based on their performance in the monthly APPL events. There are currently no available membership spots for the APPL. We wholeheartedly encourage participation in all other social and competitive pinball events across Arizona! Please click this link to find out about other pinball events across our state. All of these events welcome participation of all, regardless of experience.